Sober, but not without a little twinkle, this monogram "AM" adorns a fine linen pocket square. Stunning ! 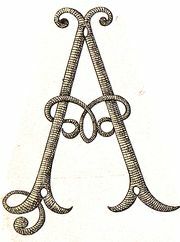 An excellent example of the outlining style used for large letters which were then filled in with embroidered point de sable dots. This monogram, embroidered on the finest lawn linen hanky, is a masterpiece of delicacy and minutiae. Early 20th c. AG measuring 9 x 7 inches and embroidered in high relief of plumetis. A playful use of leaves and berries makes for a beautiful and whimsical design!